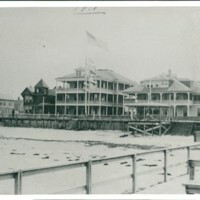 Subject contains "Virginia Beach (Va.)"
The Pocahontas Hotel from the ocean side, 1924, in Virginia Beach. 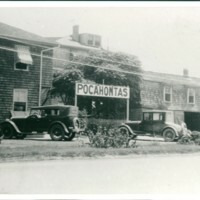 The entry to the Pocahontas hotel, 1924, in Virginia Beach. 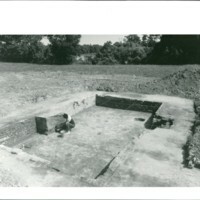 The flume at Thirteenth Street was constructed in 1890 to convey water to Lake Holly to allow saltwater fishing for guests. 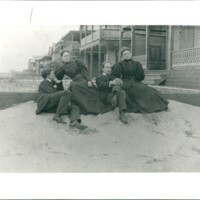 Couples lounging on the cottage line on March 7, 1896, during the Virginia Beach "winter season." 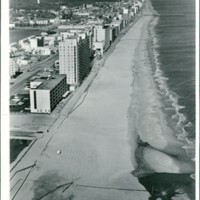 An aerial photo on a winter's day of the Virginia Beach oceanfront looking north showing modern hotels sometime in the 1980s. 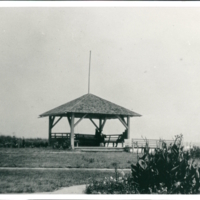 The Pocahontas Pavilion at the Virginia Beach oceanfront, shown in 1924. 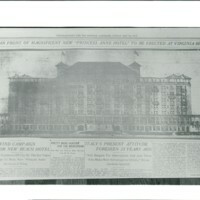 Rendering of the new Princess Anne Hotel in the local newspaper in 1915, to replace the hotel destroyed by fire in 1907. This hotel was never built. 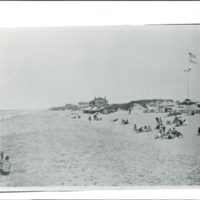 Cottage line, Virginia Beach, ca 1920, Twenty-Fifth and Twenty-Fourth Streets. 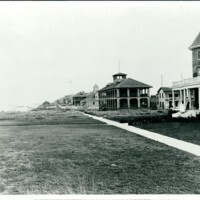 House on right is the cottage built by Norfolk businessman J. C. Tait in 1906. 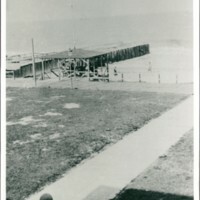 Beyond is the Breakers Hotel, with the 1903 Life-Saving Station. 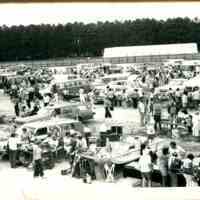 Vacationers at the beach in Virginia Beach on an unspecified date. 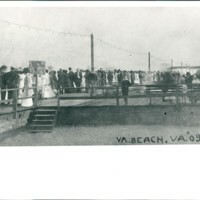 Picture postcard featuring activity on the Virginia Beach boardwalk, 1909. 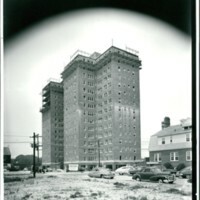 Mayflower Apartments under construction, Virginia Beach Oceanfront, 1950. Tallest apartment building in Virginia when it opened in 1951. 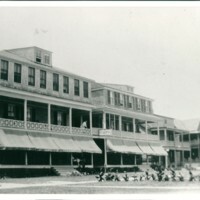 Arlington Hotel, located on the right in the photograph, in 1911. 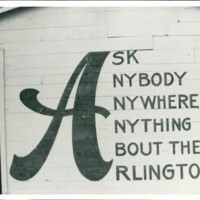 "Ask anybody anywhere anything about the Arlington" on side of building, Virginia Beach, 1911. 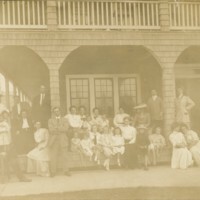 Guests gathered on the porch of the Ferebee Hotel on Fourteenth Street, Virginia Beach. 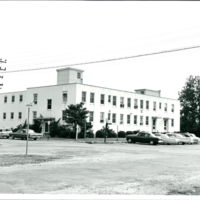 A photograph of the General Hospital of Virginia Beach, formerly located on Arctic Avenue and 25th Street. 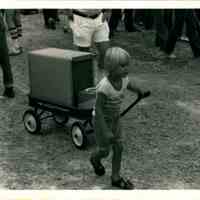 A boy pulls his wagon of goods at the Women of Wesleyan (WOW) flea market. 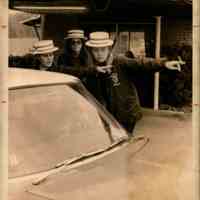 Two young women point a driver toward an unspecified direction at the 1972 Women of Wesleyan Flea Market. 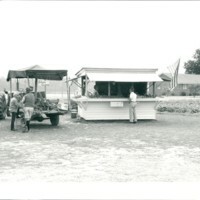 An individually run produce stand operated by Jack Fentress on land south of Pungo, Virginia Beach.